Tobacco pipes have been the main method of smoking tobacco long before the Europeans discovered the new world. Since the 16th Century European smokers have used a wide range of materials to smoke tobaccos and many of these are still used today. The most common material to make tobacco pipes from is Briar, the heart of the root of the heath bush. Clay and Porcelain were once common place in the UK and Europe, but now are mainly just collected and only smoked by a small number. Peterson pipes, Falcon Pipes, Savinelli pipes, Afred Dunhill, BBB pipes, Butz Choquin pipes, Comoy's pipes, Dr Plumb pipes, Stanwell pipes, Viking pipes, are just some of our massive collection of tobacco pipes. Here at GQ Tobaccos we carry an extensive range of Factory and Artisan crafted tobacco pipes, in a range of materials, shapes and sizes. 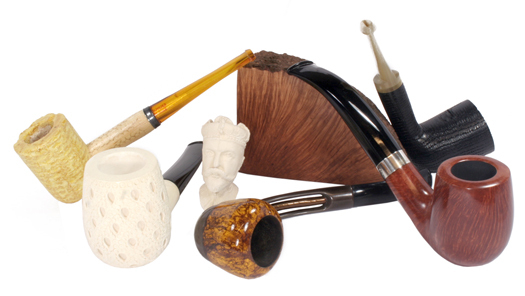 See our resource centre for the different pipe shapes and you'll be sure to find a tobacco pipe shape for you.